This chapter can be of interest to anyone new to PC music making. It explains how you can get the HV-Formant or any other VST plugin working as an instrument in a midi sequencer / audio work station program. Steinberg's Virtual Studio Technology (VST) is an interface for integrating software audio synthesizer and effect plugins with audio editors and hard-disk recording systems. VST on wikipedia There are many VST instruments and effects available, the HV-Formant is one of them. The programs that can load VST plugins are called VST hosts and a lot of them are available as wel. VST hosts can range from simple one's like savihost that loads only one plugin to verry complex one's like Cubase 4. Other populair VST hosts are FL-Studio and Ableton Live. Most of the VST host programs are so called Digital Audio Work stations or DAW programs and most of them are fairly coplex and not suitable for beginners. EnergyXT2 is an easy to use yet powerfull Digital Audio Workstation (DAW) program made by XT Software. It enables you to explore the possibilitys (including the Heptaverton Surround mode) of the HV-Formant VSTi plugin version. Audio Stream Input/Output (ASIO) ASIO on wikipedia is a computer soundcard driver protocol for digital audio specified by Steinberg. Although most music programs can work with the Microsoft Windows Direct X drivers it is very important to use ASIO or even better ASIO 2.0. Read the quick guide and use the HV-Formant standalone version to determine your soundcard options. If your soundcard doesn't have ASIO drivers and you don't want to buy one that has you should download the universal ASIO driver form www.asio4all.com and install it. In the process of making music on a computer you collect a lot of stuff, audio clips, samples, midi files, plugins, presets etc.. It is best to store this content in such a way that you can use it from within different programs in a more or less standard way and that it is easy to make backups. I suggest that you make a "audio" folder to store al this content. In this folder you make subfolders for the different content types. For the VST plugins I suggest a folder "VST plugins" within this folder you make a folder called "instruments" to store all your VST instruments and a folder "effects" to store your VST effects. 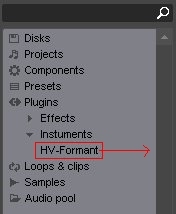 Within the "audio" folder you should also make a subfolder "presets" with a "HV-Formant" folder. Because I use other VST host programs next to EnergyXT2 I made a subfolder in my Audio folder called "EnergyXT2" Within this folder I store all the content related to EnergyXT2. You can arrange your audio workspace in many ways and it will never be perfect. If you don't have it yet, download the free trial version of the "HV-Formant" from the Download/Buy section. Open the downloaded .zip file (HV-Formant(version).zip) and drag (move,copy) the "HV-Formant.dll" file to the "[Disk:...]\Audio\VST plugins\instruments" folder. If you bought the Licence key than store it in the same folder. EnergyXT2 has a verry good online tutorial that explains the setup of the program. The next steps are to get you going as quicly as possible with the HV-Formant plugin within this program. Start the program, if you followed the previous steps it should work. If it doesn't work somthing is wrong with the sound setup. Select the file menu and select Setup. click the audio tab and check if the ASIO drivers are selected! If it still doesn't work go to the support site of EnergyXT2. Setup the plugin folder: Select File->Setup and click the Folders tab. Add the "[Disk:...]\Audio\VST plugins\instruments" and the "[Disk:...]\Audio\VST plugins\effects" folders to the plugin section. From here you can also setup the Projects,Presets,Clips and Sample sections. If you start EnergyXT2 it wil automatically load the demosong project in the sequencer view. Follow the next steps to add the HV-formant to the setup of this project and use it on one of it's tracks. If everything is ok, you are looking at the Sequencer view of EnergyXT2. Click on the Modular tab. You are now in the modular view. Here you can see how all the components that are used in this project are connected. Drag the HV-Formant from the browser window plugins section to the Modular view. If you don't see the HV-Formant in the plugins section, you did something wrong in the setup of EnergyXT2 and have to check the previous steps. It can take a few seconds before the HV-Formant shows up in the Modular view. After it shows up it is automatically connected and you are ready to use it. To use the HV-formant you now have to select it as an instrument on one of the tracks. Go back to the Sequencer view and right click the third track called "guitar". select output, uncheck the Synthesizer and check the HV-Formant. If you now start the Demosong it wil play the Guitar track on the HV-Formant "Phased Lead" preset. 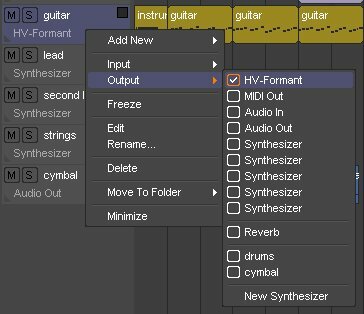 Click on the HV-Formant in the Guitar track and it wil open the HV-Formant from where you can change presets and turn knobs. Have fun. This concludes the "HV-Formant and EnergyXT2" chapter. If you concluded this chapter with success you should have enough knowledge to use the HV-Formant as VSTi plugin in any VST host program.